Cover to the DVD release of Part I showing the main characters from Parts I and II of the OVA, Shogo Yahagi (left) and Yui Takanaka (right). Megazone 23 (メガゾーン23, Megazōn Tsū Surī) is a four-part Japanese cyberpunk original video animation created by AIC, written by Hiroyuki Hoshiyama and Emu Arii, and directed by Noboru Ishiguro, Ichiro Itano, Kenichi Yatagai and Shinji Aramaki. The series debuted in 1985. It was originally titled Omega Zone 23 (オメガゾーン23, Omega Zōn Tsū Surī) but the title was changed just before release. The story follows Shogo Yahagi, a delinquent motorcyclist whose possession of a government prototype bike leads him to discover the truth about the city. Released on the VHS, Betamax, Laserdisc and VHD formats, the first part was a major commercial success upon release in 1985, selling over 216,000 copies in Japan, mostly to video rental stores. At a price of ¥7,800, the first part grossed approximately ¥1.7 billion ($21.3 million) from video sales in Japan. The film's concept of a simulated reality has drawn comparisons to later films including Dark City (1998), The Matrix (1999) and Existenz (1999). The first two parts occur roughly 500 years after humanity left Earth, as the government attempt to hack into the civic computer, Bahamut, for their city, in order to use the city's benevolent artificial intelligence, known as EVE, to influence the people to help them in a near-endless war against the Dezalg. Into this is thrown Shogo Yahagi, after he is given ownership of a strange experimental bike by an old friend of his. Over the course of the story, he discovers how false his world is, and eventually makes contact with the EVE Program, who enlists him to assist humanity in any way he can. However, unfortunately, before he can do anything meaningful, the city's government have become focused on the destruction of the Dezalg, and have decided to terminate Shogo and EVE, who has fled into cyberspace. In the end, Eve manages to save Shogo and his friends, sending them in Bahamut's system core to Earth as the battling ships are destroyed, ending the conflict, at the price of an unknown number of people on both ships. The third part occurs several centuries after this, with a hacker named Eiji Takanaka, who is scouted by a rebel group working against the teachings of a mysterious spiritual leader known as Bishop Won Dai. Sion, a high-ranking member of the rebel group, who work under the aegis of Orange Amusements, begins scouting Eiji, while also investigating a strange program, Project Heaven, the E=X Bureau, Won Dai's elite staff, are preparing. Sion manages to confront Eiji as Orange attempt to stop whatever Project Heaven is, and, badly wounded, instructs Eiji to go to the lowest point in the city, finding the real, centuries-old, Eve Tokimatsuri, who was meant to be awoken by Shogo Yahagi. She takes him to Bahamut, meeting the independent version of Eve from the previous two parts, while Sion manages to stop Orange from making the same mistake as several centuries before, using it to broadcast the E=X's master plan. In the end, Eiji and Eve confront Won Dai, and he is slain, Eve heading to the ADAM moonbase to shut down and destroy it, while also taking out the city's computer, finally beginning the final part of the plan enacted around a millennia before, while Eiji heads off to meet with Ryo to begin his life anew. 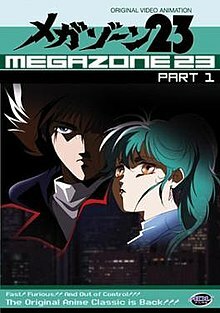 Megazone 23 was conceived as a 12-episode television series set to air on Fuji TV, but it was changed to a direct-to-video project after the sponsors withdrew their support mid-production. According to Noboru Ishiguro, the end result was a "compilation movie" of already produced episodes. Megazone was not conceived as a multi-part story. As such, the original release of "Part I" lacks the subtitle that has been added to subsequent re-releases. Original mecha designs for the OVA series were created by Shinji Aramaki, while character designs were made by Toshihiro Hirano and Haruhiko Mikimoto, who would provide Eve Tokimatsuri's character designer for all three parts. For "Part II", Yasuomi Umetsu was the character designer, and for "Part III", Hiroyuki Kitazume took over. The original planned title was "Omega City 23," then "Vanity City" and "Omega Zone 23," but trademark issues compelled the producers to a title change. The number "23" was originally a reference to the 23 municipal wards of Tokyo. In the retroactive continuity established by Part III, the number refers to the 23rd man made city-ship, with Megazone 1 named "Big Apple." However, the title is pronounced "Megazone Two Three" as referenced by several reference books and anime magazines published during the release of the series, the Japanese Wikipedia entry, and even within the series itself in "Day of Liberation." An ad on the Japanese crowdfunding platform Campfire listed that AIC are working on a remake and a new project in the series.Soon after, AIC announced that the project would be a remake of the series titled Megazone 23 SIN, and a sequel titled Megazone XI would also be in production with character designer Masahiko Komino. At AnimeJapan 2019, AIC announced that only Parts I and II of the original Megazone series would be remade in the reboot series. "Part I" was spliced with Super Dimension Cavalry Southern Cross by Carl Macek to create Robotech: The Movie in 1986. The new cut reestablished Shogo's character as Mark Landry  and included a new ending animated specifically for Robotech: The Movie. The Japanese "International Edition" of Part 2 has an English-language voice cast that Carl Macek had orchestrated. The consequent adaptation rewrote Shogo as "Johnny Winters" and Yui as "Sue." This creates a continuity error, as the name that appears on her bike helmet remains unchanged. The International Edition also added a narration to the exclusive alternate footage from Robotech: The Movie; the retooled scene became an introduction to Part 2. Megazone Part II International was released on laserdisc in Japan. It was not included in the out-of-print DVD Box Set, but was available as a bonus item to those who purchased all three installments individually. It is currently available as a Region 2 DVD bundled with the Limited Edition of the PS3 game Megazone 23: Aoi Garland. Streamline Pictures later released a straight-dubbed version of Part 1 in 1994. Streamline Pictures released an unedited dubbed version of Part 1 to VHS in 1995, which was released to DVD in 1998 by Image Entertainment. Streamline also planned on releasing the other two parts, but were unable due to a dispute with their distributor Orion Pictures. Manga Entertainment also released a dubbed version of Part 3 in the United Kingdom. In 2004, ADV Films released each installment of the series with a newly produced English dub and the original Japanese language track. The 2004 editions also contained extensive liner notes on the development of Megazone 23. ADV released a complete collection in 2007. With the closure of ADV in 2009, the series is now out-of-print in the US. Megazone 23 was remastered onto Blu-ray in Japan, and released on November 27, 2015. AnimEigo announced on their Gunsmith Cats Kickstarter that they are planning to do a kickstarter campaign of this series soon, similar to Bubblegum Crisis before. Publisher ADV has compared and found many similarities between the Megazone 23 series and The Matrix (1999), but The Wachowskis have denied it was an influence during the development of the film series. Megazone 23 has also drawn comparisons to the films Dark City (1998) and Existenz (1999). Character and vehicles from Megazone 23 appear in Super Robot Wars D for the Game Boy Advance. In 2007, a video game based on the series, entitled Megazone 23: Aoi Garland, was released in Japan for the PlayStation 3. ^ "ADV Films Announces Street Date for Megazone 23 Part 1 And Other Releases". Anime News Network. April 14, 2004. Retrieved September 24, 2018. ^ "ADV Announces December 11 Releases". Anime News Network. October 25, 2007. Retrieved September 24, 2018. ^ 緊急特報! !あの「マクロス」のスタッフがオリジナルビデオアニメに挑戦「オメガゾーン23」 [Breaking News!! The staff of "Macross" are challenging it with an original anime video "Omega Zone 23"]. My Anime (in Japanese). Tokyo, Japan: Akita Shoten: 117. October 1984. ^ "AIC Ad: New Megazone 23, Pretty Sammy Projects in the Works". Anime News Network. February 21, 2017. Retrieved May 31, 2017. ^ Antonio Pineda, Raphael (July 6, 2017). "Megazone 23 SIN Remake Project Starts Crowdfunding for Promo Video". AnimeNewsNetwork. Retrieved March 31, 2019. ^ Antonio Pineda, Raphael (March 24, 2019). "Megazone 23 Reboot Project Only Remakes Part I and II". AnimeNewsNetwork. Retrieved March 31, 2019. ^ "Anime Bargain Bin Reviews- Robotech the Movie". Anime Bargain Bin Reviews. Retrieved 2010-03-20. ^ a b "Megazone 23 Trilogy - Buried Treasure info". Anime News Network. Retrieved 2010-03-20. ^ "Megazone 23: Part 1 (OVA) - CrystalAcids.com". www.crystalacids.com. Retrieved 8 May 2018. ^ "Streamline Pictures – Part 4 -". cartoonresearch.com. Retrieved 8 May 2018. ^ "Megazone 23 (OVA) - CrystalAcids.com". www.crystalacids.com. Retrieved 8 May 2018. ^ "メガゾーン23 Blu-ray Archive BOX -30th ANNIVERSARY EDITION-". Retrieved 8 May 2018 – via Amazon. ^ Woodhead, Robert J (April 9, 2019). "April Schedule Update & News". Kickstarter. Retrieved April 9, 2019. ^ "ONLINE CHAT - Larry & Andy Wachowski". Warner Brothers. Archived from the original on 2008-05-07. Retrieved 2010-03-20. ^ "YouTube - Super Robot Taisen D - Megazone 23 Final Fight". YouTube. This page was last edited on 9 April 2019, at 23:02 (UTC).